The Government of Canada has reviewed business innovation and released a report containing recommendations for business innovation leading to wealth creation. David Phipps ResearchImpact-RéseauImpactRecherche re-imagines these recommendations for the 99%. Le Gouvernement du Canada a évalué l’innovation des entreprises et a publié un rapport contenant des recommandations portant sur la création de richesse par l’innovation en entreprise. David Phipps du RéseauImpactRecherche- ResearchImpact repense ces recommandations pour les 99%. On Tuesday October 18 the Federal Government released its Expert Panel Report on the Review of Federal Support to Research and Development (R&D). 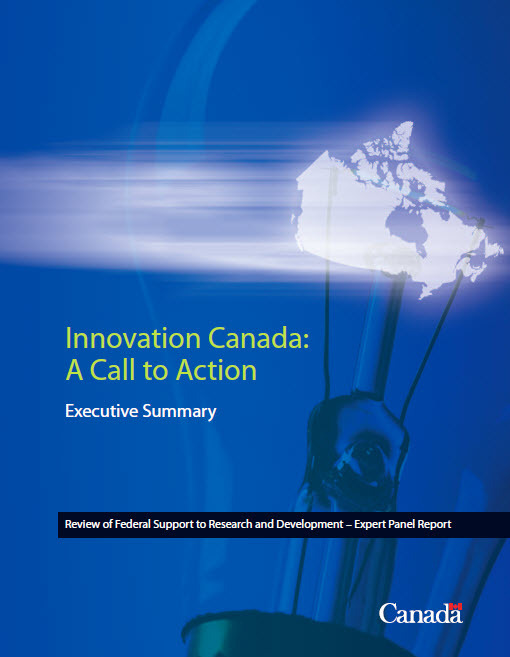 Titled “Innovation Canada – A Call to Action” the report was the culmination of a review of federal support for business led R&D. It made a number of recommendations for federal action. It is clearly a report designed to maximize wealth creation in Canada. The Chair of the Expert Panel, Tom Jenkins, was explicit about this in his remarks to a packed luncheon at the Delta Chelsea Hotel. ResearchImpact-RéseauImpactRecherche (RIR) was there. 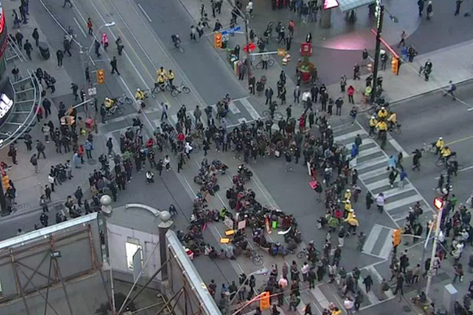 Canada, like many nations, is experiencing protests to raise awareness of the 99%, or the growing gap of income disparity. This report was released to a room full of black, grey and blue suits on the same day that a group with more colour in their clothing and skin was marching on Bay Street. I found these two events to be an incongruous juxtaposition. To be fair, Tom Jenkins mentioned cross-sectoral collaboration in his remarks but this is as close as he came to mentioning Canada’s vibrant community sector which is actively supporting the 99%. When will we see a national call to action for social innovation, a form of innovation that seeks to create new solutions to persistent social, cultural and environmental challenges? We have often written that knowledge mobilization (the process) results in social innovations (the outcome). Some of Canada’s universities such as those in the RIR network are investing in KMb services. 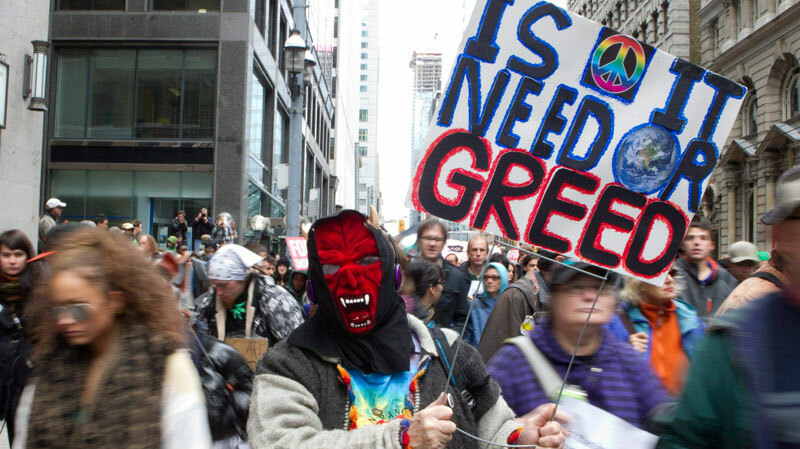 RIR supports a national call to action for innovation for the 99%? The Canadian Task Force on Social Finance was a good start. It focused on innovation in impact investing which is necessary, but not sufficient, for social innovation. Had the federal government undertaken a review of federal spending on social programs and produced a report it would contain recommendations for action. Imagining such a report, the recommendations from Innovation Canada – A Call to Action are reinterpreted here for the 99%. Create an Industrial Research and Innovation Council (IRIC), with a clear business innovation mandate (including delivery of business-facing innovation programs, development of a business innovation talent strategy, and other duties over time), and enhance the impact of programs through consolidation and improved whole-of-government evaluation. Create a Community Research and Innovation Council with a strong focus on campus-community collaboration. Have a three tiered strategy including research, training and knowledge mobilization. This strategy would include a focus on metrics to be able to measure and report on success. This Council would work closely with the Social Sciences and Humanities Research Council, the Canadian Federation of Humanities and Social Sciences and the United Way-Centraide Canada as well as other leaders in Canada’s social/community sector. Simplify the SR&ED program by basing the tax credit for SMEs on labour-related costs. Redeploy funds from the tax credit to a more complete set of direct support initiatives to help SMEs grow into larger, competitive firms. Create a tax system that provides incentives for investment in social innovation and social enterprise (see the Canadian Task Force on Social Finance). Revise laws governing non-profits such as Ontario’s Not-For-Profit Corporations Act which now allows not-for-profits to make a profit from commercial operations so long as those are reinvested into the organization. Make business innovation one of the core objectives of procurement, with the supporting initiatives to achieve this objective. 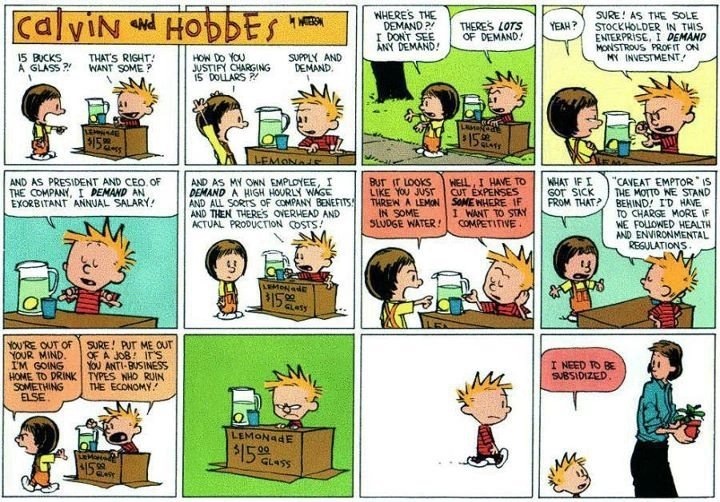 Reframe spending on social programs into an investment in (“procurement of”) social services. Demand a social return on investment and create incentives so that continued investment is dependent on success as demonstrated by agreed upon metrics. Transform the institutes of the National Research Council (NRC) into a constellation of large-scale, sectoral collaborative R&D centres involving business, the university sector and the provinces, while transferring NRC public policy-related research activity to the appropriate federal agencies. Learning from the NCE New Initiatives in Knowledge Mobilization, invest in an expanded mandate for the National Research Council and the Networks of Centres of Excellence to support national networks of social innovators that include community, university/college, government and private sector partners. Help high-growth innovative firms access the risk capital they need through the establishment of new funds where gaps exist. Canadian Task Force on Social Finance – one place the social sector seems to be leading. Establish a clear federal voice for innovation, and engage in a dialogue with the provinces to improve coordination and impact. A federal minister for innovation must have two portfolios for commercial and social innovation but two portfolios that are not siloed. These two portfolios must enable collaboration across sectors. This is what I imagine these recommendations to be. Recommendations for the Government of Canada to invest in innovation for the 99%. I suggest Canada saves the money it would have spent on a social sector R&D review and invest it in seeding action on some of these recommendations. Thanks for your comment. Very timely topic.